If you wear glasses you know how important it is to keep them safe! Now you can do so in personalized style! This eyeglass case is truly the perfect thing for anyone with glasses, whether they're for ready or everyday. This eyeglass case is made of beautiful full grain leather. 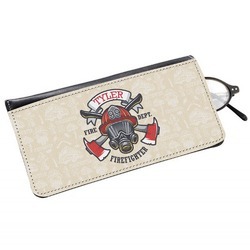 The back is a black leather, while the front will be a leather printed with your design. 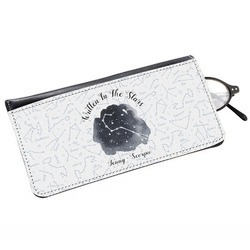 The inside is lined with a soft black fabric that will keep your eyeglasses safe. It measures at about 6.375"W x 3.375"H x 1.25" D, which should fit most eyeglasses. In order to care for your eyeglass case be sure to use leather conditioner. If you do so occasionally, it will keep your case looking brand new. Take a tour through our design center where you will find patterns, ribbons, frames, fonts, quotes, graphics, and more! Use all of these to create a fun design that will make you smile. If you need any help with your creating, we are right here! Just give us a call! 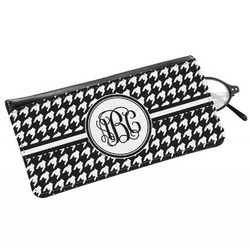 This case makes for a great Gift! If you are looking for other gift ideas be sure to check out our double wall tumblers, RTIC bottles, makeup mirrors, zipper pouches and more!